The oldest surviving bridge in the city, the Old Dee Bridge carries the road which leads from the bottom of Lower Bridge Street to Handbridge. The Romans built the first brige crossing the Dee in this site, the present red sandstone, seven arched structure is medieval. 'When, for the purpose of repairing or rebuilding the wall or the bridge of the city, the proper officers commanded that one man be furnished from each hide, the lord of such man that did not attend was fined fourty shillings to the King and the Earl'. Repairs were carried out on the structure during the next two centuries but in 1279-80 the timber superstructure was swept away. Legend states that when King Edward I crossed over on his way to fight his campaigns in Wales he was so angered that he decreed that if a stone bridge was not constructed he would sack the city. Fortunately when he returned in 1280, the current bridge was in place. Further repairs were carried out in the 1340s and the 1350s. In 1387 the citizens of Chester were allowed to convert the murage (the toll for repair of the town walls) for a further repair. The bridge once had strong towers, a drawbridge and portcullis. 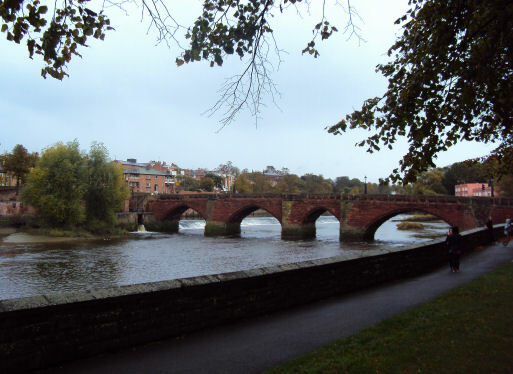 It was damaged at the time of the Civil War during the siege of Chester, to prevent the Parliamentary forces from using the city as a base.The bridge was widened to allow a footpath on the upstream side in 1826. At around this time it was agreed that it was becoming inadequate for the expected traffic and it was decided to build an additional bridge to link the city with North Wales. This resulted in the Grosvenor Bridge, designed by Thomas Harrison and opened in 1832. 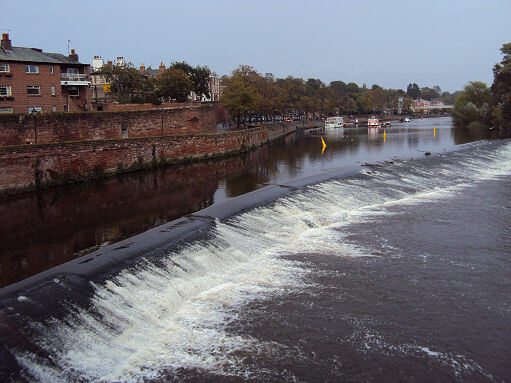 The great weir on the Dee in front of the bridge was constructed around 1093 and was commisioned by Hugh Lupus, first Earl of Chester, to supply power to his corn mills which were located where the small modern generating station at the north end of the bridge now stands. The field opposite is known as Edgar's Field, so named for the Saxon King Edgar. The King stayed at a palace on this field in 973 A.D. From here the king visited nearby St Johns Church where six tributary kings swore allegiance to him. The Roman Minerva's Shrine, which dates from the early second century, can be seen there.